The Trolley at Christmas in the City. Photo by: M & V Limousines Ltd.
With the holidays barreling down upon us faster than ever before, what better way to ring in the yuletide season than to take in the unique and exciting sights and sounds of Christmastime on Long Island via the 2016 Christmas Express Trolley Ride? Running from Dec. 22 through Jan. 1, the Christmas Express is celebrating their 24th anniversary and – as proven year after year – is set to provide yet another nostalgic thrill sure to fuel happy memories for years to come. 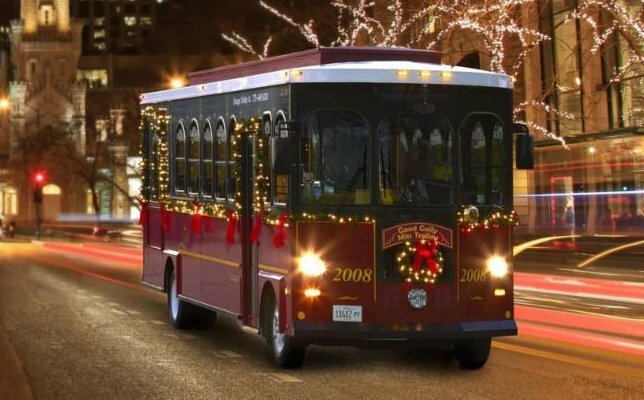 Presented by M&V Limousines Ltd., the Official Bus Company of the Long Island Ducks baseball team, the 2016 Christmas Express Trolley Ride offers a spectacular way to experience the holiday season like never before. Available at various pick-up locations on Long Island to ensure you never have far to travel, the Christmas Express Trolley – decorated in a wistful, nostalgic manner recalling rich Christmases of years gone by – will take you and your loved ones to different spots across the island to see various holiday light displays guaranteed to take your breath away with their colorful splendor. Participants will also be entertained throughout the tour by the delightful sounds of Christmas Carols dancing throughout their ears, and while taking in the light displays, passengers can warm their tummies with complimentary hot chocolate (or bottled water, if they prefer), served by one of Santa’s very own elves! The Christmas Express Trolly Ride making a stop. Photo courtesy of M&V Limousines. But that’s not all, because what holiday extravaganza would be complete without a visit to Jolly Old Saint Nick? That’s right, after the tour completes lucky kids will be taken to visit Santa Claus himself, where they can confide in him their extensive Christmas lists and tell him what good little boys and girls they’ve been the past year. 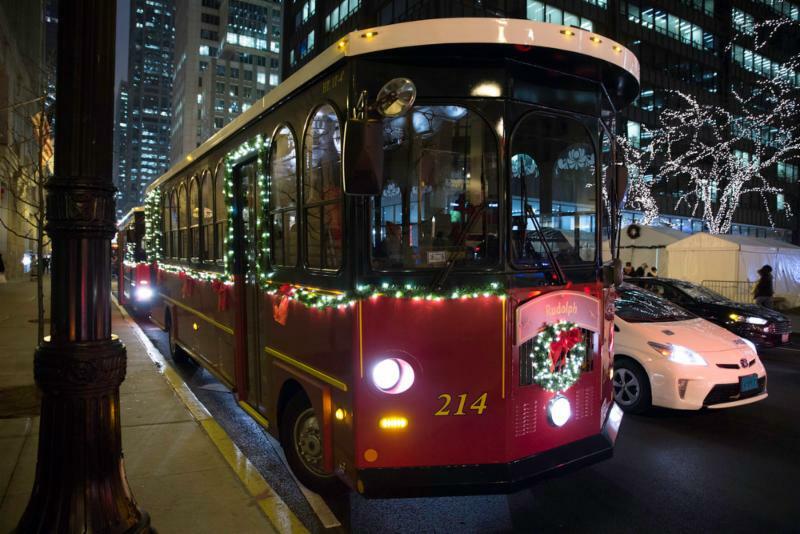 The 2016 Christmas Express Trolley Ride last approximately two hours starting at 6 p.m., with pick-up locations to be determined locally. Tours will run Wednesdays through Sundays from Dec. 8th until Jan 1st. and tickets cost only $39 per person. So, if you’re interested in capturing the yuletide spirit this year with your friends and loved ones, there’s no better way to celebrate the most magical time of the year then by being ushered through the breathtaking holiday light displays that are done no better anywhere else than on Long Island, by the 2016 Christmas Express Trolley Ride. Watch your children’s faces light up with joy and, in doing so, you just might find yourself re-capturing some long-lost childlike wonder of Christmastime yourself. If you’re interested in learning more about the 2016 Christmas Express Trolley Ride or want to book a reservation, please call 631-543-0908 or email at info@mvlimo.com. Subject: LongIsland.com - Your Name sent you Article details of "The 2016 Christmas Express Trolley Ride is Set for Yuletide Adventure"